Jim Eby passed away Monday evening, September 28, 2015, after earning his wings and going to a better place under a full moon. He was born November 30, 1946, in Glendale, Calif. The beloved husband of Jennifer for 42 years, he was a good, ethical and loyal person – an absolute one-of-a kind. Jim’s inviting smile, great patience, laughter and warm heart were the foundation of lifetime bonds with innumerable family members, friends and acquaintances. He had a self-deprecating nature and acerbic wit as well as tremendous intelligence, about which he was always humble. He loved working with people creating and building things, skills he applied diligently in his long career, particularly the past 3 years at Valencia Technologies, a medical device startup. There, a place he loved going to work, he was Chief of Operations for implantable medical devices. Jim found it gratifying to have his work improve the lives of others. He accepted people for who they were, and was able to bring out the very best in them. 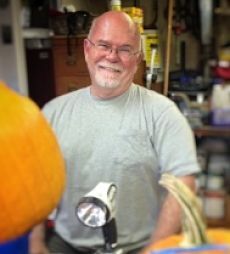 An outstanding family man, Jim loved dressing up as Santa Claus and carving elaborate, stunning Halloween pumpkins, among other avocations. He believed every day possible should be a celebration. One of his favorite activities at home was working in the garden under the supervision of Kate and Gracie, the family’s two black labs. Jim died of metastasized melanoma. The family wishes to thank the Cancer Center of Santa Barbara, Visiting Nurse and Hospice Care, his doctors and his friends, all of who gave extraordinary support to Jim and his family over the past months. Jim’s daughter, Tracy, a kind, calm and compassionate presence, was at her dad’s side through every difficult step along the way. His son, Tom, Tom’s wife Ann and son Jack were also steadfastly at his side, helping him in multiple ways and making sure Jennifer and Tracy were well taken care of. Jim is survived by his wife, Jennifer; daughter, Tracy, of San Luis Obispo, Calif.; son, Tom and Tom’s wife Ann and grandson Jack of Mountain View, Calif.; brother Richard Eby and his wife Caroline of Oak Park, Calif.
Jim will be missed tremendously by all of those whose lives he touched, and his spirit will live in their hearts and souls forever. A celebration of Jim’s life is planned for the near future.